Zeiss today officially announced the new powerful, wide-angle and compact Loxia 25mm f/2.4 Lens for Sony full frame E-mount cameras. 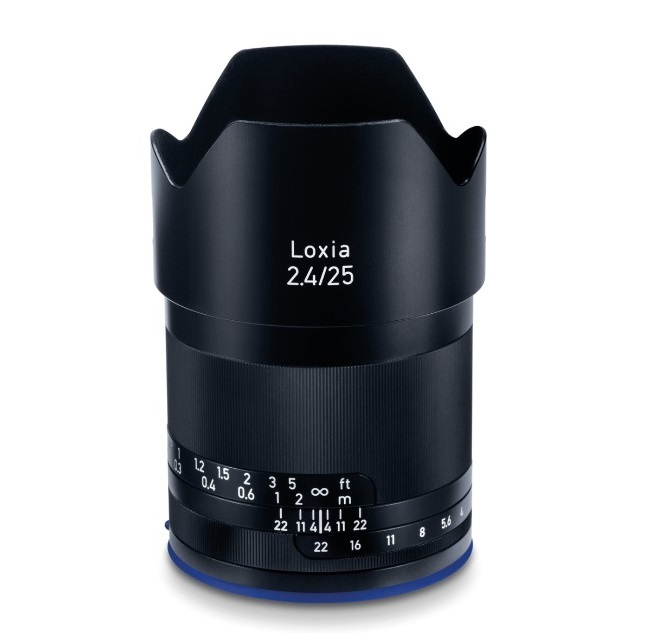 The price of the new ZEISS Loxia 2.4/25 is €1,299 (incl. German VAT) or $1,299 US (excl. local taxes). The lens hood is included. Shipping will start in March 2018. With the ZEISS Loxia 2.4/25 compact wide-angle lens, ZEISS is adding a new focal length to its lens family that will benefit both landscape and architectural photographers: “High resolution across the entire image as well as low distortion ensure the perfect result,” says Product Manager Christophe Casenave. “The compact lens delivers great images thanks to the new optical design.” The ZEISS Loxia 2.4/25 also features high-quality mechanical parts, and the durable metal housing makes this a reliable lens for photographers on the road. Small, robust and versatile: the lenses in the ZEISS Loxia family for mirrorless cameras in the Sony Alpha series are particularly well-suited for street and travel photographers who love being inconspicuous as they capture special moments in cities and in nature without carrying around a lot of equipment. The compact design of the ZEISS Loxia lenses has been specially developed for the mirrorless full-frame Sony E-mount cameras. Used in tandem, the lens and camera enable filmmakers and photographers to achieve a high-quality result, while the equipment’s modest dimensions ensure users always have whatever they need with them. “This is a significant advantage for anyone who wants to blend into the background and is also on the road a lot,” says Product Manager Casenave. The all-round talent from the ZEISS Loxia family is also great for filming. Traditional photography and cutting-edge technology all in one: with the ZEISS Loxia 2.4/25, photographers can let their artistic creativity run free. “A steady hand and the manual focusing means users achieve impressive results,” says Casenave. The electronic interface for the ZEISS Loxia 2.4/25 transfers both lens data and focus movements to the Sony camera and then activates the focus peaking or the zoom function. Demanding photographers can achieve a wide range of creative possibilities thanks to precise, manual focusing, including a retro look and feel.